Roof lanterns are the perfect way to add a feature to your flat roof, letting maximum levels of natural light in whilst providing a unique feature and views of the sky above, which is particularly impressive on a clear night. Here at Roofing Superstore we have a range of roof lanterns from high quality and reputable brands such as Reflex, Atlas and Korniche. You may have an extension with a flat roof, but who said your rooflights have to be horizontal too? From dining rooms to bathrooms, bedrooms to lofts, roof lanterns are the perfect way to give small spaces a mighty impact and make your home feel lots more airy and spacious. Choose a roof lantern and all that natural light will be channeled right into the centre of your room, meaning the rays flood into every nook and cranny. They can do wonders for your room height and, because they’re made up of multiple panes of glass, they let in up to three times more light in than a vertical window, making them perfect for darker rooms. Plus, they’re a great way to save energy thanks to all that extra light and warmth you’re getting during the day. But these clever design features are so much more than practical problem-solvers. Roof lanterns add a real touch of design magic to your home, giving a dash of drama to dining rooms, adding uninterrupted overhead views of the starry skies at night and making your home look stunning from the outside, too. Reflect has created a range of slimline roof lanterns for your home, focusing on providing maximum daylight to the room below. 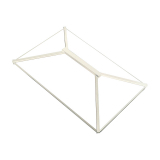 Designed to be timeless, Reflex rooflights feature minimal glazing bars to create the slimmest roof lantern available. 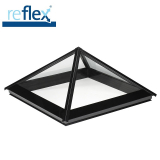 The Reflex slimline roof lanterns come with self-cleaning glass, and a frameless bottom edge, which allows for easy run-off, and reduction in build up of dirt. 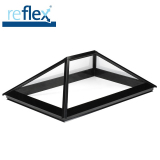 The slimline rooflights from Reflex come in 5 different colours, and in a range of different tint glazes, depending on privacy requirements, glare and light transmission. 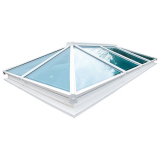 Atlas Roof Lanterns offer a wide range of roof lanterns for your flat roof. Atlas roof lanterns let in around three times as much daylight into a room as a classic flat roof window, flooding the room with daylight and reducing the need for artificial lighting. Atlas roof lanterns come in a range of traditional and contemporary styles, and are renown for their ease of installation. Additionally, you can order custom-size roof lanterns from Atlas to create the perfect unique feature in your home. 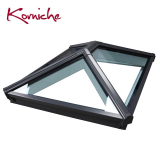 Korniche is one of the leading brands in the roof lantern market, particularly known for creating sleek and attractive products that are also incredibly functional. 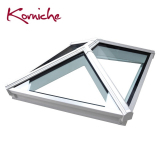 Using advances in technology, the Korniche roof lantern has no cold bridging – one of the main ways in which heat loss occurs. 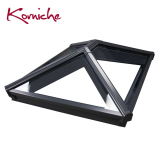 They also are incredibly sturdy and stable – the 6x4m Korniche lantern can withstand over 8 tonnes without breaking. If you're not sure what size or brand of roof lantern you require, check out our roof lanterns size guide for help.